Q: You are currently working on an exhibit for the StubbyDog Project, “Babes & (Pit) Bulls.” Please talk about the inspiration behind this exhibit as well as what you hope to accomplish with the exhibit. A: I saw the movie “Beyond the Myth” and it really opened my eyes to how little, if any, positive press this wonderful breed gets. There was one story in particular about a family in Denver who had their pit bull Cocoa, who was a beloved member of their family, confiscated, imprisoned and ultimately killed purely because of the way the dog looked. Just thinking about it makes my heart ache. This athletic, social and willing-to-please breed has been so abused and so misunderstood in recent times, but was originally widely accepted as a trusted and loyal family member. Thanks to irresponsible and mean spirited pit bull owners with the worst intentions, this breed has been vilified in our society and the media, so I wanted to do a campaign that portrayed pit bulls in a positive light – as fun loving, sweet and loyal family members that wouldn’t hurt a soul. Soon after seeing “Beyond the Myth” I was asked by a friend to photograph a pit bull named Dutch who she was fostering. I took photos of Dutch, a powerful, huge and athletic mush ball, with my 5-year-old daughter; she was lying on top of him, and it was just the sweetest thing. The response this photo received when I posted it online was overwhelming and all positive, and I got the idea to do the exhibit of photographing pit bulls with their kids and contacted StubbyDog for help promoting it. I am very excited and grateful that StubbyDog is sponsoring this event with me. The exhibit is going to be in May, and I am hoping to get a lot of media attention for it and get some well-deserved good press for pit bulls! There are so many pit bulls waiting for homes in shelters across the country and so many will never even get to be put up for adoption because people are too afraid of their reputation to consider them. It would be great if this campaign could help change this current way of thinking. Q: Can you tell the StubbyDog community how you left the corporate world for a life with dogs? A: In the late 1990s, while living in San Francisco, I got really burned out with my corporate job. I decided to make a change and started Bone-A-Fide Dog Walking with a close friend. At the same time I picked up photography as a hobby and found I loved photographing our clients’ dogs. While I left the dog walking business after a short time, my future career as a pet photographer was born! When I started photography as a full time job in 2003, I mainly focused on weddings and events to support myself and I did pets on the side. Over time, I found that my real talent was in capturing pets, and in the last few years I’ve made a shift from my wedding photography business to having pet photography as my main source of work, for which I’m so grateful. Q: Please share with us a little about your volunteer experience and how you are using photography to raise awareness and funds for various organizations. A: When living in New York City, I volunteered my services at the ASPCA, photographing events and the shelter pets for their website. This turned into a weekly, paid job for me, and I loved it more than anything. During my extensive ASPCA experience photographing shelter pets, I learned more than ever what the power of an outstanding photo can do to market shelter animals – and how a great photo makes all the difference in the world in grabbing attention and hearts. A photo that captures the unique and beautiful qualities in each animal helps immensely in getting that animal adopted. Nothing makes me happier than hearing from someone that a photo that I took was what made them go meet with their adopted pet! When I moved to Westchester, N.Y., a little over three years ago, I reached out to local shelters to volunteer my photography skills, and I now do photos for Adopt-A-Dog in Armonk, SPCA of Westchester, OPIN Pets of Stamford, Bully Breed Rescue and other groups as well as individual foster families. I try to help raise money as much as I can because so many of these wonderful shelters and rescue groups are in dire need of funds and operate on such small budgets. Being able to help with whatever I can is a cause most dear to me, and these groups are the difference between life and death for a rescue animal or an animal in need of rescue. A few times a year I do pet photo events at several Best Friends Pet Care centers in the tri-state area. I do mini-sessions in return for a small donation to local rescue groups. I also donate pet portraits to the silent auctions at all the local pet rescues’ galas and fundraising events. 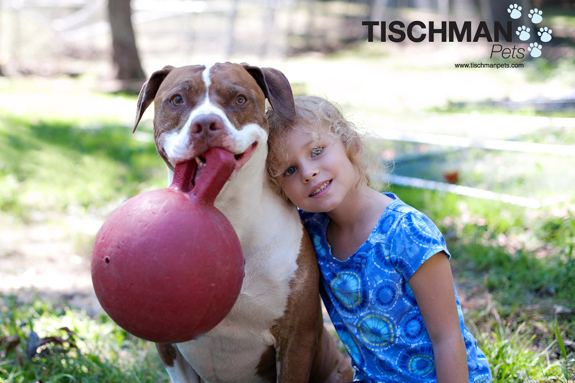 In addition, I take out a bi-monthly ad for Tischman Pets Photography in my town’s weekly newspaper. It always features an adoptable pet from the SPCA of Westchester. 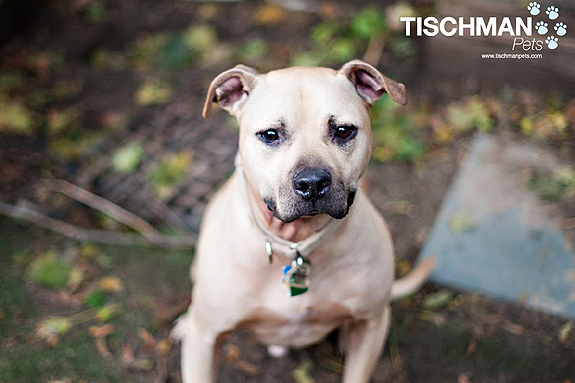 This helps raise awareness for a pet and for the shelter as well, and helps establish Tischman Pets Photography as the go-to pet photography company in the area. In 2012, I am going to start a giving back program in which I will donate 10 percent of my sitting fee to a different shelter or rescue each month. 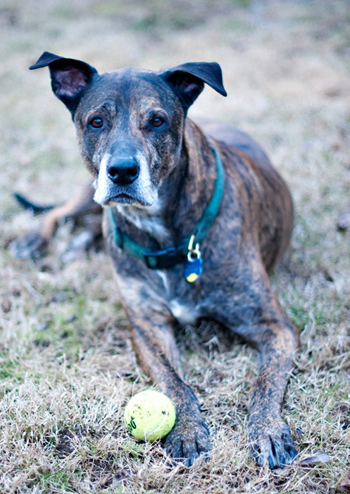 This spring I am doing a seminar for the Mayor’s Alliance on how to take better photos of shelter pets. It is for the volunteers of all the area rescue groups and shelters who are members of the Mayor’s Alliance. I have lots of advice and tips to share, and I am excited to help people capture better photos of their rescues pets. Q: Your pictures celebrate and capture the bond pets and their people have, which is not simple to do. Do you have any tips or funny stories you would like to share? A: I enjoy meeting other pet guardians, so when I do a pet shoot that includes the people, I always make sure to give myself plenty of time to meet everyone before we start shooting. It’s important to meet the pets and give them time to warm up to you and that goes for the people as well. It also helps that I am very non-threatening, and when I am on a shoot I have the ability to remain calm and cool at all times. I find this has a calming effect on the subjects too. This is particularly important when dealing with nervous or skittish pets. A few months ago I shot a senior cat that was sleeping when I came, and I spent several hours trying to win her over to no avail. She is giving me the stink eye in every single picture! We had to laugh about it, as it was so obvious that she didn’t like me being there one bit! I felt so terrible about not getting any flattering photos of the cat that I decided to go back and try again. It took a couple of months to do the reshoot, and when I returned it was a warm day and the cat was outside enjoying the sun and must have been in a much better mood, and the photos came out awesome. In fact, I am making a coffee table book for my client right now, and am going to make a studio sample for myself as well! My clients and friends do tell me I have enormous patience with animals and kids, and I guess that is often what it takes to get really unique and honest shots. Q: What’s the biggest misperception about pit bulls you wish you could change? A: The perception that these dogs are monsters. They are just dogs and all dogs can be aggressive and bad; the blame has to be placed on the owners and disreputable breeders who exploit this breed, not on the dogs. Before pit bulls it was German Shepherds, Dobermans, Rottweilers, etc. When you exploit any powerful breed and abuse them to get what society considers undesirable behavior, you have to look at the people responsible for this. Dogs just want to please, and if you train and condition any breed to do dangerous things, you can turn a Poodle into a nightmare! Q: Do you have a pit bull? 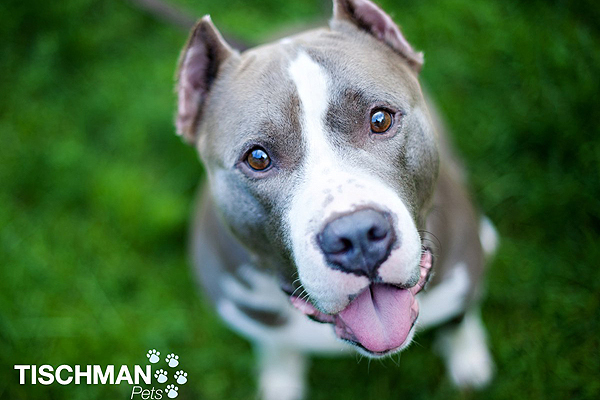 Why do you support pit bull rescue? A: My dog Baxter (photo right) is a big mix – and he likely has some pit in him. I support pit bull rescue because they are my favorite breed, and I have met countless pit bulls in shelters that I know would make the best dogs, and it kills me that so many great dogs have to get euthanized every year. I think they have such fabulous personalities and they are super smart, not to mention super photogenic. Rarely have I photographed a pit bull at a shelter who doesn’t at least know the sit command. It seems a shame that so many of these dogs get passed over in shelters for other breeds simply because there is such a negativity associated with the breed. My next dog will definitely be a rescued pit bull! Q: Of the different dogs you have photographed, do you have a favorite? A: I was honored to have met Vicktory dog, Handsome Dan, (photo below) and to photograph him for the Babes & (Pit) Bulls project. He doesn’t warm up to people easily, and he took to me very quickly which made me so happy. He is a special dog who has been through so much and is the only Vicktory dog that lives with a small child. I was able to capture some great photos of him with his human little sister and am excited to share them at the exhibit in May. AWESOME keep up the GREAT work you do. I really wish there were more folk on the Eastcoast that was as passionate as those on the Westcoast. It’s baffling to me that so much of what I see/read is happening on the Westcoast (which is great) however, the need to raise awareness here on the Eastcoast is just as great. NO matter which way I turn it’s disheartening & I’m frustrated that my plea, my offering help appears to be going unnoticed. Geoffrey Tischman is amazing! His photographs are gorgeous, and he works so hard to help these dogs. 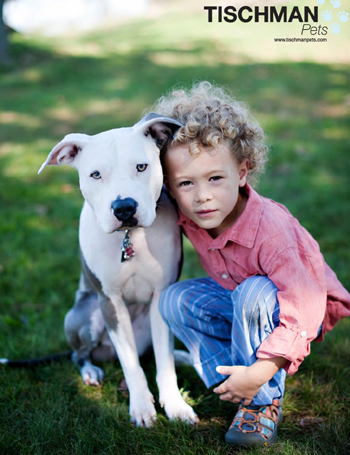 That’s my curly boy above with our pit bull…so proud to be part of this project!